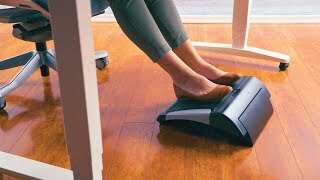 If you feel like your office chair is too tall for you or if you ever feel restless while seated, a little foot support can help. Our E3 Adjustable Footrest is adjustable to let you find that perfect angle that keeps your feet comfy. How is this footrest adjustable? The Adjustable Footrest adjusts to four different angled positions by flipping out the rest's two legs in different configurations. This gives you the freedom to change angles when you feel like a switch! Can I wear high heels with this footrest? Yes, the Adjustable Footrest comes with a treaded rubber top surface, which means you can use it barefoot or with shoes, even high heels! My feet fall asleep when I sit for a long time - what does this mean? That can mean many things, among them that you are too petite for your chair or your chair is too tall for your body type. Make up the difference with support at the feet with the E3 Adjustable Footrest.